The Rose Garden is a collection of more than 3,600 antique and modern roses. Established in 1995 through an extensive community effort, the garden contains more varieties than any other public rose garden in the western hemisphere. While the City of San Jose supplies materials, it is maintained primarily by volunteers. Projects will vary with the time of the year. Volunteers can learn how to maintain their own roses or just enjoy helping with the maintenance of this special rose garden. Ongoing volunteer workdays: Every Wednesday and Saturday from 8:30 to 11:30am. Rain cancels. No need to sign up to volunteer unless you’re coming with a group greater than six, just show up! Workday on 2/13/19 is CANCELED. Free Hands-On Rose Pruning Lessons: Every Wednesday and Saturday from 8:30 to 11:30am, January 5th, and ending at the conclusion of February. Please come prepared with: clothes you can get dirty, Long pants, closed toed shoes, water bottles and sun protection (hat and sunscreen) are a must. 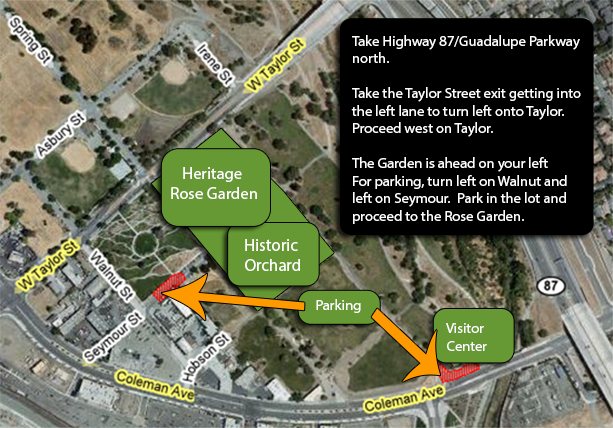 Meet at the Heritage Rose Garden shed–parking is available at 412 Seymour St., San Jose, CA. If you are under 18 years old, click here. Minors need to bring this completed form to volunteer, signed by a parent or guardian. Minors 15 and under must be accompanied by an active parent, guardian, or teacher at a 1:10 ratio. Minimum volunteer age is 14 years old. If you are interested in bringing a group out, please e-mail volunteer@grpg.org. Parking can be found at the Seymour parking lot at the intersection of Seymour & Walnut, or 412 Seymour St., San Jose, CA. Click here for directions.